These collaborative efforts have paved the way for WASH organizations to work smarter at tackling open defecation. And it has proven effective. Over the last decade, Cambodia’s rural families have adopted toilets at an unprecedented rate, pushing sanitation coverage in rural villages from 25 percent to more than 50 percent and rising. While there are several mechanisms in place for collaboration, hundreds of organizations continue to rely on ad-hoc cooperation; new players coming into the space have no central hub for information on current activities and existing research; and stakeholders are rarely able to avoid costly duplication or to find ways to align their work and create synergies. The sector has reached an inflection point. In order to follow the steep curve from 50 percent coverage to universal sanitation in the next decade, there is an urgent need to invest in dedicated support and deliberate, systematic facilitation that will allow actors to optimize their use of existing mechanisms, collaborative more effectively than in the past, and use resources much more efficiently. As the opening quote suggests, Collective Action is not about forging a new path for the sector, rather it’s about leveraging the structures already in place and finding ways to make the existing network more dynamic and able to innovate in response to challenges. Essential questions to answer will include: Are there critical issues that are being overlooked? Where do overlapping or duplicated efforts occur? Are the necessary stakeholders at the table, not only government and NGOs, but also donors, private companies, and academic institutions? And importantly, how does the sector ensure the NAP is realized? This workshop was the first step in laying the foundation for the Collective Action approach. Stakeholders from multiple sectors spent the day discussing how their organization’s activities align with the sector vision for universal sanitation and the barriers preventing the sector from reaching the vision. Importantly, it was a day spent fostering new and ongoing relationships amongst sector peers in the private, public, and academic spheres, identifying where they converge, and how they can work better together. The realization by sector stakeholders to pivot away from subsidies towards CLTS and sanitation marketing has resulted in a positive and rapid uptake of latrines. Mr. Pom said Cambodia is on track to surpass the 2018 goal of 60 percent rural sanitation coverage. But he cautioned that the uphill climb to reach the 2025 goal is only getting steeper and will require “a new way of thinking” to reach the very top. 1. How does the sector vision guide your work or approach? 2. What would it take for your organization to fully align with the sector vision? 3. What can we do to overcome barriers to achieve the 2025 vision? Many critical questions remained unanswered. Should the sector stop activities that are not fully aligned and not part of the NAP? How does the sector align methodologies so different approaches are not in conflict and organizations avoid duplicating efforts in similar geographies? And which issues should the sector tackle first with finite resources? To begin answering these questions, the RuSH group will conduct an Organizational Network Analysis (ONA) and systems mapping exercise to gain insights into how stakeholders interact with each other. The analysis will identify the actors that influence or play a role in achieving the 2025 vision, and shed light on how they collaborate and share information to achieve that vision. 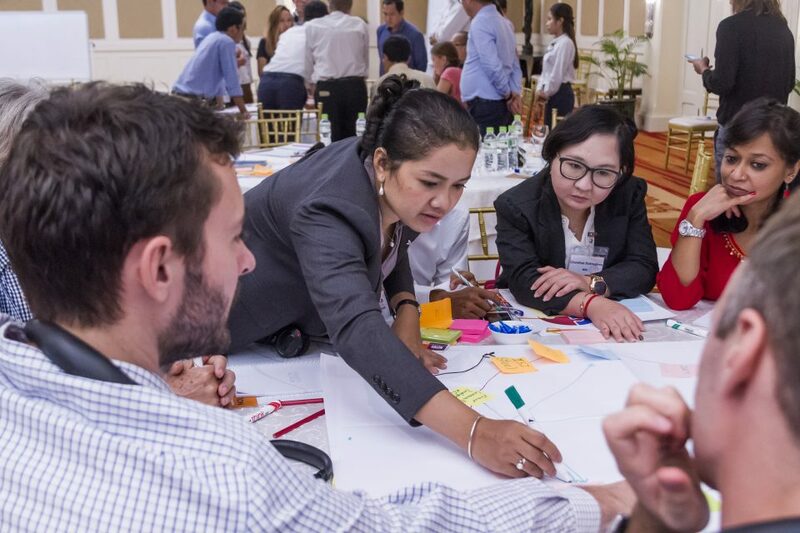 To conduct the Organizational Network Analysis, Cambodia’s rural sanitation and hygiene sub-group (RuSH) is turning to LINC – a US-based company that develops tools to map organizational networks and to leverage systems-based approaches for development. At the workshop, LINC started the afternoon session with a series of activities that helped participants visualize what it means to have a shared vision and work together towards that shared vision. It’s challenging work ahead for the sector. To achieve universal sanitation in the next decade, what should Cambodia’s RuSH network look like and what shape should it take over time? Networks are fluid, remarked a participant. We can continue to shape it and change how it works in order to meet sector needs. 1. Identify organizations that fit within the network boundary: the ONA requires a clear network boundary to avoid getting too big. “It can expand so much that the information that comes out is no longer valuable,” explained Mr. Fromer. The boundary for this network analysis requires organizations to 1) have a presence in Phnom Penh, and 2) one of the following: a) have a mission or strategy that includes a focus on RuSH; b) have at least three staff working 50 percent or more of their time on RuSH activities; or c) allocate more than USD $25,000 of their annual budget to RuSH activities. 2. Conduct interviews: a group of enumerators will visit more than 100 organizations that appear to meet the network boundary set out above. The enumerators will ask a series of questions to understand existing relationships as well as how organizations see the current challenges and issues in the RuSH sub-sector. 3. Analyse data and report: results will include, for example, which actors are the most connected; which act as a good bridges between stakeholders; if relationships are typically reciprocal, and how aligned actors are in achieving the RuSH sub-sector vision.